For your easier orientation the whole design of our software solution for central print management follows the composition of an email client: New print jobs arrive in the incoming folder where they can be easily moved to other folders you can create by yourself according to your preferred filing system. If you select a print order all order information is displayed in the bottom window, if you double-click you will open it in a new tab. The user interface is clearly arranged and intuitive in order to provide an self-explanatory user experience. Besides single print orders you can also manage multiple and mixed print order comfortably. If an order consists of multiple print jobs, each print job is marked with a color as soon as you select the order and they also have a consistent order number with an individual appendix. So you see at one glance which print jobs belong to one order. Your users can also send you mixed orders consisting of print jobs, articles and copy jobs. You can manage all those different items together in your order list and send status updates, for example. You don't need to set up a second workflow for the management of articles or copy jobs. Use the included search & filter toolbar to easily find specific print orders. You can search single folders or use the global search. 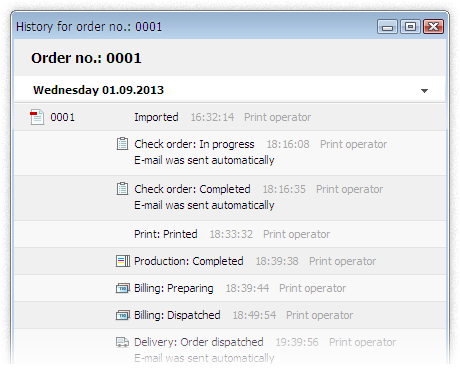 The filter options help you to manage your orders: You can filter the print orders by their current order status. For example, filter only those print jobs that are in production at the moment to prepare the shipping. Misprints are annoying, time consuming and expensive. In order to avoid them you can check incoming print orders directly in the order list with the dedicated preview. 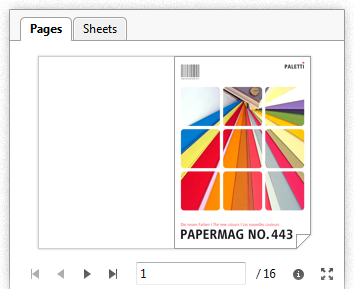 You can switch between page preview and sheet preview, you can flip through the whole document and you can zoom in & out. If you want to edit the document you can use further previews in the job editor. 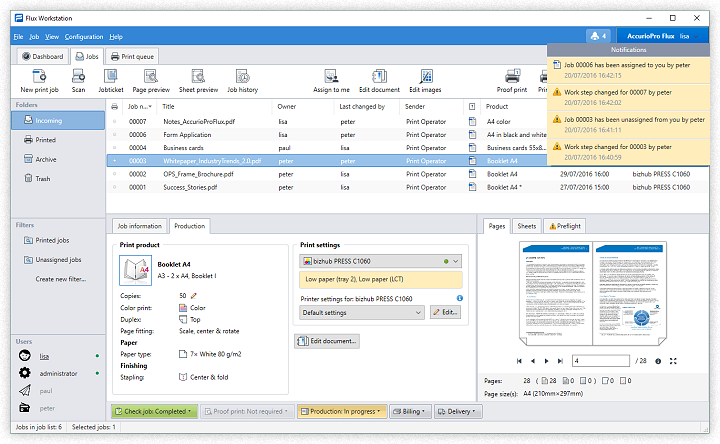 As soon as a print order arrives in our software solution for central print management, a order history is created automatically. Here you can see at any time if the order was already printed, its current status and if emails were sent to the user. The order history gives you an up-to-date overview which is especially useful if more than one person is working with our application. Do you want to create custom queries and reports? We provide everything you need to do so. All order data is now saved in an SQLite database and remains there, even if you delete the orders in your order list. The database can be accessed via ODCB driver (available here for free download) by 3rd party tools, e.g. Microsoft Excel. Since the order details are saved in the state they arrive and again in the state they are printed, you can create diverse queries and comparisons. Do you want to use the stored order data to create invoices or do you want to use the data within another application? For these purposes we included an export functionality which allows you to export all order data as CSV-file. CSV is a common file format that is widely supported by most applications. Get in contact to receive your offer.